First and foremost, my parents — Vilayanur Subramanian and Vilayanur Meenakshi — who strongly encouraged my early interest in science. (My dad bought me a Zeiss research microscope when I was ten years old, and my mother whetted my appetite for chemistry by giving me Partington’s textbook of inorganic chemistry and helping me set up a small lab under our staircase.) My brother, Vilayanur Ravi, got me interested in poetry and literature, which have more in common with science than many people realize. 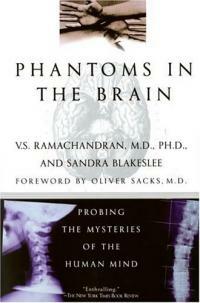 My wife, Diane, has been my collaborator in exploring the brain and helped me think through many of the chapters. Two of my uncles, Parameswara Hariharan and Alladi Ramakrishnan, fueled my latent interest in vision and brain science (when I was still in my teens, Dr. Ramakrishman urged me to submit to Nature a paper that was accepted and published). I also owe an enormous debt to former teachers John Pettigrew, Oliver Braddick, Colin Blakemore, David Whitteridge, Horace Barlow, Fergus Campbell, Richard Gregory, Donald MacKay, K.V. Thiruvengadam and P.K. Krishnan Kutty, and to various colleagues, friends and students, Reid Abraham, Tom Albright, Krish- naswami Alladi, John Allman, Stuart Anstis, Carrie Armel, Richard At- tiyeh, Elizabeth Bates, Floyd Bloom, Mark Bode, Patrick Cavanagh, Steve Cobb, Diana Deutsch, Paul Drake, Sally Duensing, Rosetta Ellis, Martha Farah, David Galin, Sir Alan Gilchrist, Chris Gillin, Rick Grush, Ishwar Hariharan, Laxmi Hariharan, Steve Hillyer, David Hubei, Mum- taz Jahan, Jonathan Khazi, Julie Kindy, Ranjit Kumar, Margaret Livingstone, Donald MacLeod, Jonathan Miller, Ken Nakayama, Kumpati Narenda, David Pearlmutter, Dan Plummer, Mike Posner, Alladi Prab- hakar, David Presti, Mark Raichle, Chandramani Ramachandran, William Rosar, Vivian Roum, Krish Sathian, Nick Schiff, Terry Sejnowski, Margaret Sereno, Marty Sereno, Alan Snyder, Subramanian Sriram, Arnie Starr, Gene Stoner, R. Sudarshan, Christopher Tyler, Claude Valenti, T.R. Vidyasagar, Ben Williams and Tony Yang. And special thanks to Miriam Alaboudi, Eric Altschuler, Gerald Arcilla, Roger Bingham, Joe Bogen, Pat Churchland, Paul Churchland, Francis Crick, Odile Crick, Hanna Damasio, Tony Damasio, Art Flippin, Harold Forney, William Hirstein, Bela Julesz, Leah Levi, Charlie Robbins, Irvin Rock, Oliver Sacks, Elsie Schwartz, Nithya Shiva, John Smythies and Christopher Wills. I also thank the University of California, San Diego, and the Center for Brain and Cognition (Center for Human Information Processing: CHIP) for providing a superb academic environment; in a recent survey by the National Research Council, the UCSD campus was ranked number one in the country in neuroscience. The university is also fortunate in having a symbiotic relationship with many neighbors, including the Salk Institute, the Scripps Clinic and the Neuroscience Institute, making La Jolla a mecca for neuroscientists from all over the world. Many of the investigations I describe in this book were carried out in La Jolla, but I also conduct studies on patients in India during my annual visits there. I thank the Institute of Neurology, Madras General Hospital, and the Tata Institute of Fundamental Research in Bangalore for their hospitality. Some of the ideas discussed in the book emerged from discussions I had with students and colleagues — Eric Altschuler (experiments on placebos and somatoparaphrenia), Roger Bingham (evolutionary psychology), Francis Crick (consciousness and qualia; the term “zombie” for the how pathway in the parietal lobe), Anthony Deutsch (analogy with talking pig), Ilya Farber (arm movement sensations in a denial patient), Stephen Jay Gould (alerting me to Freud’s idea on scientific revolutions), Richard Gregory (qualia, filling in and mirrors), Laxmi Hariharan (pediatric diagnosis), Mark Hauser (consciousness of bees), William Hirstein (with whom an early draft of Chapter 12 was written), Ardon Lyon (blind spots), John Pettigrew (talent as a marker of brain size), Bob Rafael (somatoparaphrenia), Diane Rogers-Ramachandran (the mock injection experiment), Alan Snyder (similarities between Nadia’s horses and those of da Vinci in the section on savant syndrome) and Christopher Wills (who helped with an early draft of Chapter 5). I am also grateful to my agent, John Brockman, president of the EDGE Foundation, not only for urging me to write this book but also for doing everything he has to help bridge the “two cultures”. Like the Earl of Bridgewater, who commissioned many popular science books in Victorian England, Brockman has been a potent force in the dissemination of science in the latter part of this century. Thanks also to Sandra Blakeslee and Toni Sciarra, who kept goading me to finish this project and helped make the book accessible to a wider readership. Finally, I owe a very important debt to my patients, who often sat through long hours of tedious testing, many of them as intensely curious about their predicament as I was. I have sometimes learned more from chatting with them or reading their letters than I have from my medical colleagues at conferences.